Trump-Xi Summit: Much Ado About Nothing? The feel-good vibes from the meeting were drowned out amid questions regarding the U.S. strike on Syria. Thursday and Friday marked the long-awaited first face-to-face meeting between U.S. President Donald Trump and Chinese President Xi Jinping. Convened at Mar-a-Lago, Trump’s estate in Florida, the meeting was billed as an informal relationship-building exercise and was designed to frame the relationship in the best possible light. Yet U.S. military action in Syria would largely derail that narrative, despite glowing comments from both Trump and Xi. Both Xi and Trump brought their top officials to the meeting. On the Chinese side, Xi was joined by China’s top diplomat, State Councilor Yang Jiechi; Foreign Minister Wang Yi; Vice Premier Wang Yang, the rough counterpart to the U.S. treasury secretary; and Wang Huning, director of the policy research office of the Communist Party’s Central Committee and one of Xi’s top economic advisers. Trump, meanwhile, was accompanied by a good portion of his Cabinet: Secretary of State Rex Tillerson (who greeted Xi at the airport), Commerce Secretary Wilbur Ross, Treasury Secretary Steve Mnuchin, and Defense Secretary James Mattis, as well as National Security Advisor H.R. McMaster. Also in attendance were figures with less important-sounding titles, but potentially more influence over Trump’s policy decisions, including chief White House strategist Steve Bannon and Trump’s son-in-law Jared Kushner. 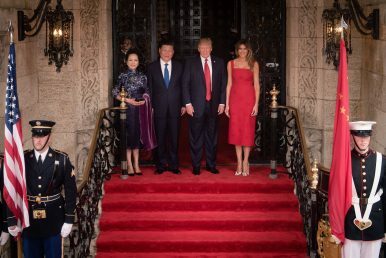 Kushner and Ivanka’s children – Trump’s grandchildren – also made an appearance, welcoming Xi and his wife by singing a Chinese folk song and reciting a Tang-dynasty poem. “I believe lots of very potentially bad problems will be going away,” Trump predicted. Xi, in his remarks, stressed the importance of U.S.-China relations. There are “a thousand reasons to make the China-U.S. relationship work, and no reason to break it,” he told Trump, Xinhua reported. A read-out from China’s Foreign Ministry described the talks as “thorough, friendly, and lasting a long time.” The statement also said Trump had accepted Xi’s invitation to visit China sometime in the next year. The most solid outcome of the talks was a proposal from China on how to restructure high-level dialogues. The Obama administration called its framework the Strategic and Economic Dialogue; the Trump administration is expected to scrap that formulation. Instead, Xi proposed four new dialogue mechanisms, focusing on diplomacy and security; the economy; law enforcement and cybersecurity; and social and people-to-people exchanges. Update: In remarks to reporters made after this piece was published, Tillerson confirmed that the U.S. and China have officially adopted this framework as the new high-level bilateral dialogue platform. The “U.S.-China Comprehensive Dialogue will be overseen by the two presidents,” Tillerson said, and will be based on the “four pillars” mentioned above. According to Xinhua, Trump and Xi also pledged to “advance negotiations on the bilateral investment treaty, and explore the pragmatic cooperation in infrastructure construction and energy.” No new deals or concrete proposals were unveiled at the meeting, however. Tellingly, Chinese media readouts made no mention of the North Korea issue, despite U.S. briefings placing that item near the top of the agenda. The closest Xi came to mentioning North Korea’s nuclear and missile programs was urging “proper” handling of “regional hotspots” and calling for strengthened U.S.-China cooperation on non-proliferation. One other phrase was notable for its absence. Chinese media reports didn’t mention “new type great power relations,” long Xi’s preferred catchphrase for describing U.S.-China ties. The Obama administration had pointedly refused to embrace that formula, but Tillerson caused a stir when he quoted Chinese rhetoric echoing the framework during his visit to Beijing. China didn’t resurrect the mantra of “non-confrontation, no conflict, mutual respect, and always searching for win-win solutions” at the Xi-Trump meeting. Instead, Xi emphasized the importance of a “new starting point” for the relationship. U.S. media, at least, was far more interested in the Syria story than the carefully-crafted summit; after brief comments to the press by Trump, reporters could be heard shouting out questions about the missile strikes before Xi was able to speak his piece. What’s on the Agenda for the Trump-Xi Meeting? To no one's surprise, trade and North Korea top the list. What else will make it into the conversations?